Moisture Control products facilitate the installation of moisture and alkaline sensitive floor coverings on non-compliant concrete substrates. Successful moisture remediation requires proper product installation and product performance that meets or exceeds industry standards such as ASTM F 3010-13. 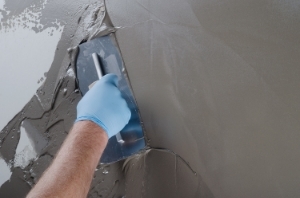 Primers for self-leveling underlayments, toppings, patching and skim coat materials facilitate proper bond between substrate and subsequently adhered flooring materials. Proper primer selection is determined by finished flooring application, substrate condition, porosity and requirements of the installed system. Self-leveling underlayments are used to provide a smooth, flat or level surface over distressed or non-compliant concrete substrates. Proper product selection is determined by finished flooring, project conditions and performance requirements. Installation may or may not require mechanical surface preparation, depending on product selected and/or substrate condition. Skimming and patching products are employed to create a suitable installation surface prior to floor covering installation. Products are trowel applied and can be placed in multiple lifts if required. Product selection is determined by the overall thickness required, surface conditions and anticipated use of the area. Both interior and exterior rated products are available. Self-leveling toppings or overlayments are used to provide a new wear surface over concrete substrates in need of resurfacing. 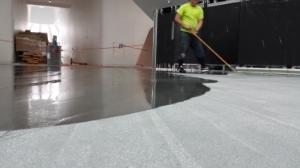 SLT's are generally high-strength, abrasion resistant products designed to be polished, stained, dyed, coated and/or sealed for use as a finished floor system. Interior and exterior rated products are available. Adhesives are available in pressure sensitive, hard set and wet set. Urethane, Epoxy, Acrylic and Spray products offer adhesives for all applications. We are a full Line MAPEI and Spraylock adhesive dealer, with products for any glue down application. Tile & stone installation systems consist of Mortars, mastics, grouts, sealers, water-proofing membranes and surface preparation products for hard surface applications. We are a full line MAPEI Tile and Stone Installation system dealer.